The Rick and Morty Card Game is Totally Rickdiculous! The wait for season 3 of Rick and Morty—the highlight of our lives—has moved so slowly, the clocks have practically started going backwards. But hey, at least we discovered time travel, right? So many rumors had floated around about the date the series would continue, and they all ended in heartbreaking, world-spiraling depression. Luckily, it’s only a couple more weeks until new episodes begin, but in the meantime I am back with another solace for you waiting fans—this time in card game form! 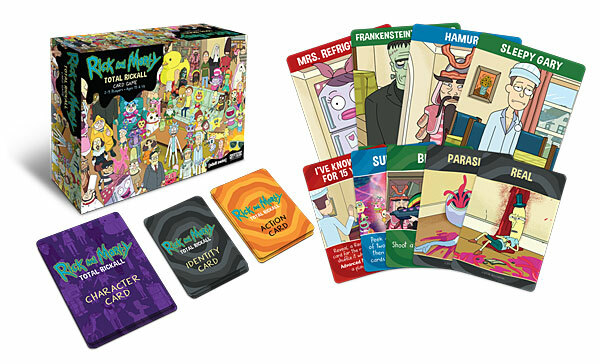 Rick and Morty: Total Rickall is a cooperative card game based on one of the most popular episodes of the series. In the game, you and up to four of your friends play as the most recent unlucky family to fall victim to shape-shifting, mind-altering space parasites! These little buggers are dangerous, as they disguise themselves as unique members of your family. They can be as simple as Jerry Smith’s brother, or as far-fetched as Mrs. Refrigerator. You would think it would be easy to tell who is a parasite or not, but these guys alter your brain to make you think they have been living with you for years. It’s up to you and your friends to sort out which characters are real, and kill the parasites before they escape and infect the planet! In the standard mode of this game, a ton of fun character cards representing all of the the weird identities these parasites can take are laid out in front of everyone, and secret role cards are placed underneath to determine just who is real and who is fake. Each player lays down an action card (usually determining who to kill on that turn) and the actions are played out in turn order. It is easy to kill anyone on the board—but be careful, if you kill too many real characters, you lose! The advanced mode is really where this game gets interesting. Advanced mode also assigns hidden role cards to the players, making it even harder to tell who is trying to help you kill the aliens, or who is trying to kill you. This is a great game that takes up a tiny space on your shelf, but offers loads of fun. For me, this game already offers a lot of joy, in that it’s a hidden role game (my favorite variety) full of Rick and Morty humor. I would recommend playing standard mode once or twice to get the hang of things, but for me, the challenging advanced mode is where the game really shines. The constant fear of being able to trust the words fed to you through a smile is almost addictive to me. What is even more addictive is being able to lie to your friends, and try to make them believe what you want them to. I personally like to start my games by telling everyone that I am a parasite, and watch their faces turn in confusion. The humor of the game is right on par with the show. For example: if you want to shoot Cousin Nicky—who can be quoted as saying “Hey! I’m walking here!” in his thick New York accent—you have to walk twice around the table while telling everyone that you are “walking here.” A lot of the other cards bring up some great lines from the show as well. Rick and Morty: Total Rickall can be found for sale for around $15, and it’s well worth the price. I personally weigh games by their cost versus how much I play them, and for less than $20 I have had more than a dozen hours of fun. I recommend this game for just about anyone, whether they are new to board games or are a seasoned veteran, and the game is a blast whether they’ve seen the show or not. If you have played this before, let me know what you think about it. Hopefully it’ll hold you over until July 30th. Wubba Lubba Dub Dub! Adam is an avid gamer who loves playing new board games. His favorites tend to have a hidden role mechanic to them, but Euro and resource-management games are close runners-up!